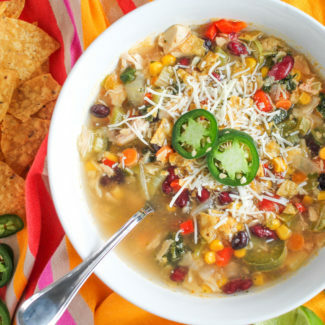 Healthy meals don’t have to be boring. 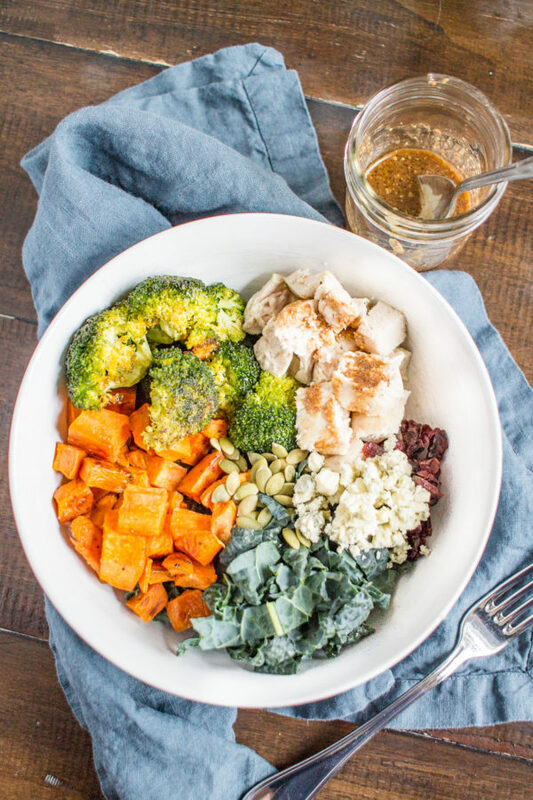 These Chicken, Sweet Potato, and Kale Bowls are loaded with flavorful roasted veggies and topped with a quick homemade mustard dressing. This is a healthy meal that I look forward to. 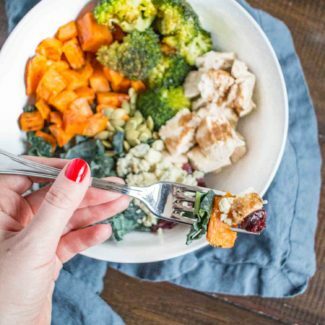 The inspiration for this Chicken, Sweet Potato, and Kale Bowls was that my friend Libb was coming over to watch Scandal. She has been making an effort to eat better, and I realized that I should probably follow suit. 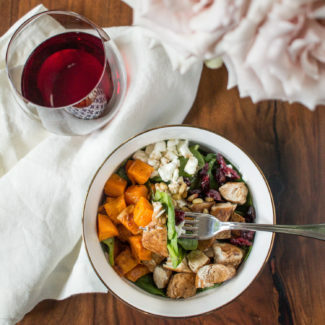 So I turned food that I already had at home into delicious, healthy, and hearty salad bowls. 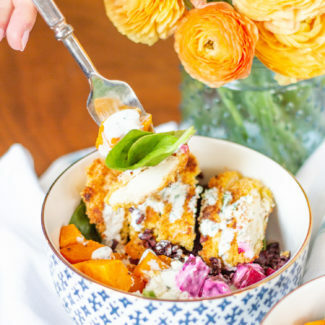 It may sound silly, but this meal is a great way to repurpose leftovers and clean out your cupboards. 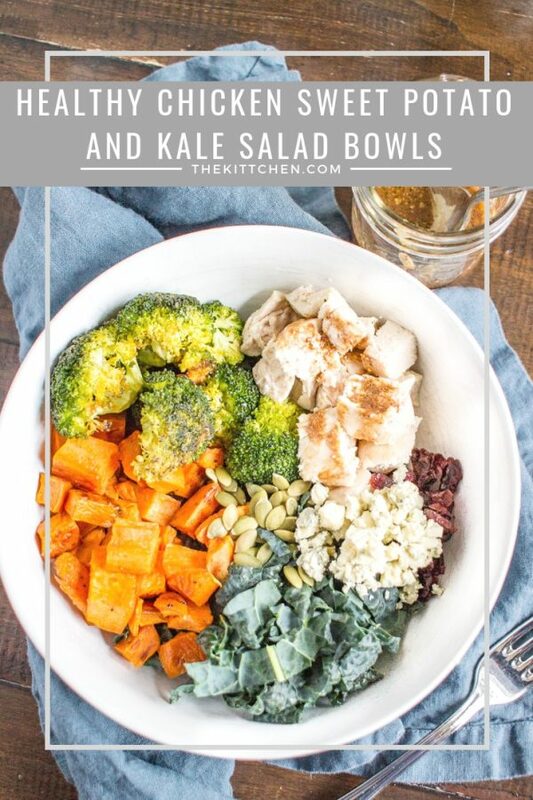 I did a quick search and I found so many delicious things to add to the Chicken, Sweet Potato, and Kale Bowls. I found a bag of pepitas, craisins, a couple sweet potatoes, goat cheese, mustard, kale, and sriracha at my home already. Usually you wouldn’t think to combine these things into a meal, but in this case it worked perfectly. When I went to the store I picked up some broccoli too. Broccoli is my favorite vegetable, so I whipped up a quick batch of my Sriracha Parmesan Roasted Broccoli. 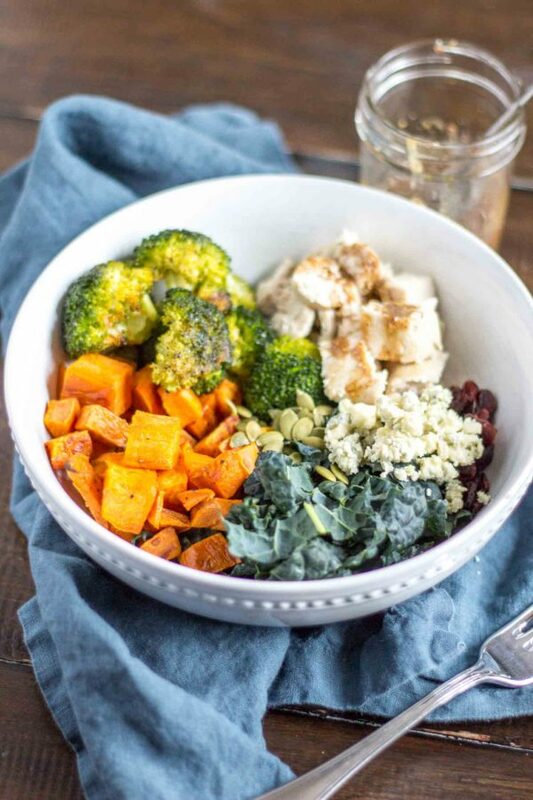 It’s the best broccoli recipe, it’s spicy, garlicy, and cheesy all at once and it added a nice hint of spice to these salad bowls. 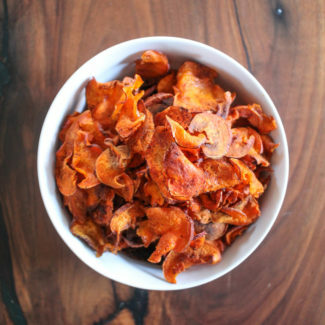 And since it is roasted, it manages to be tender and crispy all at once. Promise me that you will give this a try. To prepare the chicken I quickly seared it in a hot skillet, and then covered it and let it finish cooking over low heat for 10 minutes. 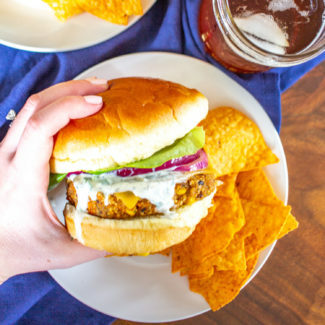 This is super easy, and it also results in really moist and tender chicken. I prepared everything in advance, and then when it was time for dinner I just heated up the sweet potato, broccoli, and chicken on a parchment-lined baking sheet. I filled the counter with all of the other toppings and we each got to assemble our own salad bowls! And then we watched Scandal, and of course, sipped some red wine. 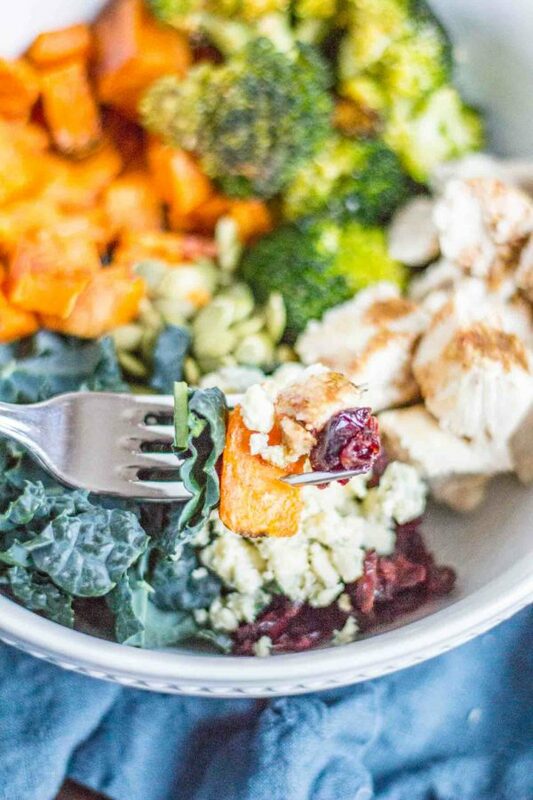 Healthy meals don't have to be boring. 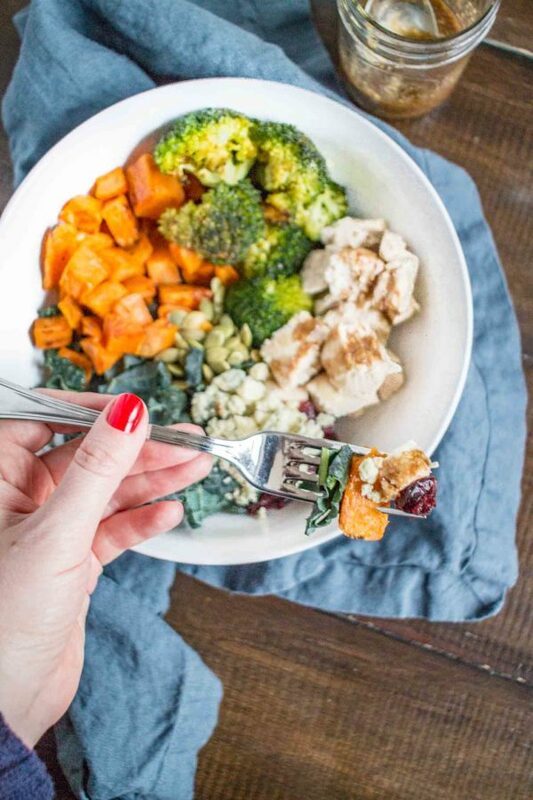 These Chicken, Sweet Potato, and Kale Bowls are loaded with flavorful roasted veggies and topped with a quick homemade mustard dressing. This is a healthy meal that I look forward to. Heat your own to 375 degrees. Peel the sweet potato and cut it into one inch cubes. Melt the butter and pour it into a large bowl with the potatoes. Add the salt and pepper, and then stir to evenly coat the potatoes. Pour the potatoes onto a parchment-lined baking sheet in a single layer. Roast the potatoes for about 40 minutes, until soft. Next, prepare the Sriracha Parmesan Roasted Broccoli. Now, prepare the chicken. Season it with salt and pepper. Heat a skillet over high heat, and add enough olive oil to coat the bottom of the pan. Place the chicken in the hot pan, searing the first side for 2 minutes. The flip the chicken and sear the second side for a minute. Then cover the pan, reduce the heat to low, and let the chicken continue cooking for another 10 minutes. Once it is fully cooked, let it rest for 5 minutes and then dice it. To prepare the mustard dressing just mix up all of the ingredients. I like to do this in a small mason jar so that I can save any extra dressing. Once the sweet potatoes, broccoli, chicken, and mustard dressing are ready, it's time to assemble the bowls! 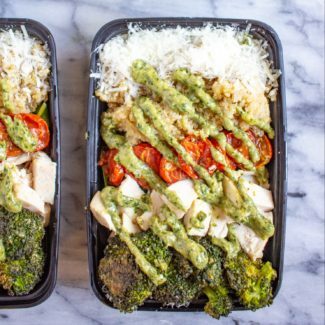 I like to start with a handful of kale, and then I add a scoop of broccoli, and a scoop of chicken. Then I add craisins, blue cheese, and pepitas. I finish things off by drizzling the mustard dressing on top. Yum! I prepared everything in advance, and then when it was time for dinner I just heated up the sweet potato, broccoli, and chicken on a parchment-lined baking sheet. I filled the counter with all of the other toppings and we each got to assemble our own salad bowls! And then we watched Scandal, and course, sipped some red wine.